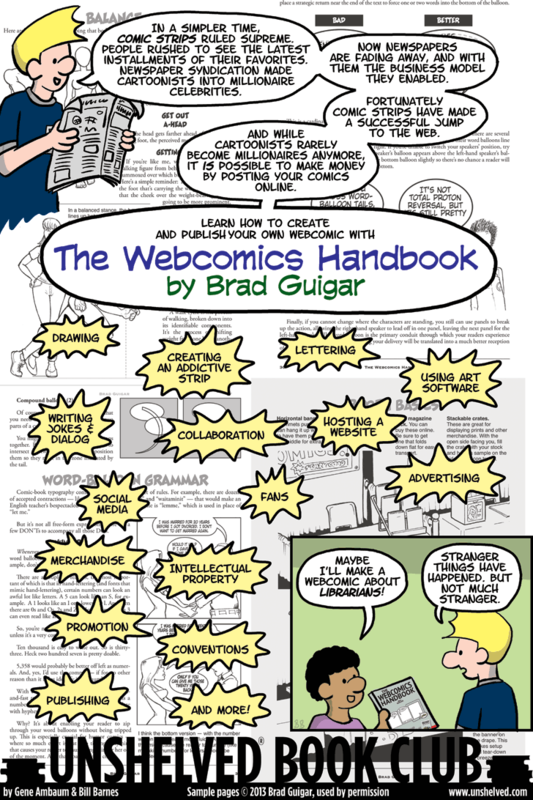 @bookblrb: How to make your own webcomic, from writing and drawing to technical details to making money. Bestselling novelist Ann Patchett muses on marriage, writing, dogs, and more in this collection of previously published essays. Why I picked it up: My grad school adviser was a friend and teacher of Patchett’s, and I’ve been a fan since her debut novel, The Patron Saint of Liars. Why I finished it: Her prose is unfussy, warm, and witty. In an essay about her need for solitude, she describes a stay at LA’s Hotel Bel Air, filled with starlets on ridiculous diets: “The man with the bread basket wanders from table to table, lonely as a cloud.” Patchett is, first and foremost, a storyteller, and even her nonfiction pieces carry a strong narrative arc. Her attempt to gain admission to the LAPD Police Academy is a prime example: in the wake of the Rodney King verdict, Patchett, whose father was a longtime LAPD captain, seeks to understand what motivates people to join a police force that seemed full of pompous bigots. You’ll root for her to pass the grueling physical tests and admire the men and women who try out with her. @bookblrb: Ann Patchett muses on marriage, writing, dogs, and more. It is the early 1960s, and Chicago is a city of uneasy tensions—segregation, sexual experimentation, free love, the Cold War—but it is also home to one of the country’s most vibrant jazz scenes. Naomi Hill, a singer at the Blue Angel club, has been poised on the brink of stardom for nearly ten years. Finally, her big break arrives—the cover of Look magazine. But success has come at enormous personal cost. Beautiful and magnetic, Naomi is a fiercely ambitious yet extremely self-destructive woman whose charms are irresistible and dangerous for those around her. No one knows this better than Sophia, her precocious ten-year-old daughter. For Sophia, Naomi is the center of her universe. As the only child of a single, unconventional mother, growing up in an adult world, Sophia has seen things beyond her years and her understanding. Unsettled by her uncertain home life, she harbors the terrible fear that the world could end at any moment, so she compulsively keeps a running list of practical objects she will need to reinvent once nuclear catastrophe strikes. Her one constant is Jim, the photographer who is her best friend, surrogate father, and protector. But Jim is deeply in love with Naomi—a situation that adds to Sophia’s anxiety. Told from the alternating perspectives of Sophia and Naomi, their powerful and wrenching story unfolds in layers, revealing Sophia’s struggle for her mother’s love with Naomi’s desperate journey to stardom and the colorful cadre of close friends who shaped her along the way. Sophisticated yet poignant, Last Night at the Blue Angel is an unforgettable tale about what happens when our passion for the life we want is at sharp odds with the life we have. It is a story ripe with surprising twists and revelations, and an ending that is bound to break your heart. HMH Books for Young Readers, 2004. 9780152052089. Owen Griffiths is a loner. He isn’t interested in anyone else, and he can’t hide that fact. He wants to go to MIT and become a scientist, though his parents have other plans for him. Then he meets Natalie. She’s a musician with focus and a very specific plan for her future. She’s also the first person he can talk to, the only person who gets him and encourages him to go for what he wants. Why I picked it up: Le Guin’s A Wizard of Earthsea is my favorite book. I’ve had this one on my shelf for a while, and picked it up the other day because I was in the mood for a short YA novel. Why I finished it: It was easy to see that Owen was falling for Natalie, and that he was starting to want more than just friendship from her, but it was hard to read how she’d react if he ever worked up the courage to tell her. The book also manages to be timeless. Because it doesn’t talk about pop culture or electronics, and focuses on Owen’s inner life, it reads as if it could be set in the now (unless you think everyone is texting or on computers all the time). It's perfect for: Parents. Owen’s dad saved up and bought his son a brand new car for his birthday. He was very pleased with himself, but he didn’t notice that Owen was not as thrilled until the following Monday, when Owen took the bus to school like he always had. There’s a lesson in there somewhere. @bookblrb: Owen is a loner. Then he meets Natalie, the first person he can talk to. Farrar, Straus, Giroux, 2013. 9780374533953. Orestes, his parents, and his six siblings live in a small Mexican town. They are so poor that they have a sliding scale based on the money they have, the inflation rate, and who is in charge of the country that determines what kind of quesadillas they can eat each day. When Orestes’ younger “pretend” (fraternal) twin brothers go missing, there’s a little more food for the rest of the family. But the family is annoyed by the way their new Polish neighbors flaunt their wealth. Orestes, in anger, steals from the Poles. His punishment is that he ends up working for them, learning the ins and outs of inseminating cows. Why I picked it up: This book has been getting some press lately for being a surrealist look at modern Mexico’s politics and economics. Why I finished it: Orestes is telling his story after many years, but his voice is reminiscent of that of his adolescent self, ignorant yet still full of wonder at how weird this world is. He’s hilarious whether he’s relating his jailhouse visit with his uncle Pink Floyd, who tells him that of course the twins were taken by aliens, or making some wry observation about the poor, “[My father] said that money didn’t matter, that what mattered was dignity. That confirmed it: we were poor.” Orestes' meeting with a politician is a surreal negotiation for the exact number of quesadillas he can eat and over how to tell his story to gain the maximum amount of sympathy from his parents, who demand only the truth but never believe it when they hear it. Readalikes: I was reminded of Sherman Alexie’s The Absolutely True Diary of a Part-time Indian, and also Junot Diaz’s The Brief Wondrous Life of Oscar Wao. The tone, the humor, and the outlandishness of those books resonate in this one. @bookblrb: Orestes and his family are so poor they measure their lives by how many quesadillas they can eat each day. Cadence Sinclair Eastman is the oldest granddaughter of Harris Sinclair, patriarch of a distinguished family. Every summer, Harris, his wife Tipper, their three daughters, and their families vacation on a privately owned island off of Martha’s Vineyard. Cousins Cady, Johnny, and Mirren were all born within a month of each other, and have an unconditional friendship formed over those summers. During their seventh summer, they are joined by Gat, a nephew of Cady’s aunt’s boyfriend. Though he fits in perfectly with the three teens, he is merely tolerated by the stodgy adult Sinclairs since he is of East Indian descent. As the fifteenth summer begins, Cady and Gat discover they are deeply in love. The perfect family is unraveling because of divorces, Tipper’s death, jealousy and greed. When Cady finds herself half naked on the beach with no memory of how she got there, the summer becomes a nightmare. She becomes withdrawn and suffers from horrific headaches and amnesia. The family, including her mother, never discuss what happened. Her doctors insist she will remember in her own over time. Two tears later, when she returns to the island, she begins to piece together what happened. Why I picked it up: I have been a big fan of Lockhart ever since I read The Boyfriend List years ago. Her writing is refreshing and introspective. I couldn’t wait to read her latest (and after I started it I couldn’t put it down). Why I finished it: Cady is convinced she has done something horrible. Johnny and Mirren never respond to her emails or phone calls. She has no way to contact Gat, and is sure she has lost him. She is also afraid she is addicted to her pain pills. It is compelling to see Cady struggle to separate her perceptions from reality. It's perfect for: Sadie, a young woman I know who lives each day trying to manage pain from an auto immune disease. She will understand Cady’s need to reinvent herself by changing her appearance and giving away everything, and I think she will find hope in Cady’s resolve to remember what happened. @bookblrb: One summer, Cady awakes on a beach half naked with no memory of how she got there. St. Martin's True Crime, 2014. 9781250010353. Florida teen Tyler Hadley posted a message on Facebook about a “party at his crib” that night. He invited friends to “hit up his cell” and come chill with him. Two hours later he bludgeoned his mother to death with a claw hammer while she typed on her computer, then went in the other room and killed his father. Forensics tests show it took more than twenty blows to finish off the father. Tyler spent hours cleaning up the blood and signs of struggle, then hosted the aforementioned party with abundant drugs and alcohol while his parents’ bodies lay in the locked master bedroom, covered with laundry. Why I picked it up: I am not much of a true crime reader, but this case gripped much of the country in 2011 and 2012 as it began to make its way through court. Why I finished it: I learned that patricide and matricide are not particularly rare. Five parents are killed by their children each week in the United States. Long term abuse is usually the cause, and the children are usually adult in age when they commit the crime. (There was no apparent abuse in this case.) Detectives, trying to prove a premeditated attack (which would make this first degree murder), put together a complicated timeline of phone and text records, as well as Facebook posts from Tyler, to show that he planned the party and issued invitations before killing his parents (who never would have allowed the party). It's perfect for: My aunt Del, who loves watching crime shows and TV specials like America’s Most Wanted and the CBS show 48 Hours. Both shows have the type of salacious headlines and whispered voice-overs that this case generated, but this is more in-depth in its exploration of motivations and the days leading up to the crime. @bookblrb: Teen Tyler Hadley invited his friends to a party at his house. Then he killed his mother and father with a hammer. Mandy's family is driving her crazy! Her three-year-old brother is annoying, her baby twin brother and sister are always wet and crying, and her parents don't listen to her. When she finds out that her second grade class is putting on a Presidential Pageant, she's positive that it's her time to shine. After all, she's the first kid in her family, so it's only right that she play George Washington. But then boring old Natalie gets picked to be the father of our nation, and Mandy has to find a different way to stand out from the crowd. Why I picked it up: In eighth grade I once wore teddy bear underwear with white pants. It's the reason that, to this day, I hardly ever wear white. Why I finished it: Mandy was delightfully and believably energetic. As an adult, I felt for her parents and teacher. I could tell they wanted to support her intelligence and enthusiasm while also making sure she learned proper behavior, and that they were sometimes overwhelmed by the task. At the same time, I could see why Mandy was feeling overlooked. Babies, especially twins, take a lot of work, and that meant that she was not getting much of her parents' time and attention. Mandy's thoughts and feelings felt real. She was a fun character who didn't mind expressing herself and wasn't afraid of challenges. I found myself wanting to be her friend, whether she was trying to do a cartwheel, sneaking gummy bears in her room, or putting up with "Freckle-Face" Dennis who teases her about her favorite undies. @bookblrb: Mandy’s siblings annoy her, her parents ignore her, and she isn’t picked for the class Presidential Pageant. Tom Sherbourne, a lighthouse keeper, lives with his wife Isabel off the coast of Western Australia on Janus Rock. One day a rowboat washes ashore. In it are a dead man and a living baby girl. Recently heartbroken after giving birth to a stillborn baby, Isabel convinces Tom to not report what they found and to raise the baby as their own. Tom buries the dead man on the beach and sends word that their baby girl has been born. But as Tom's guilt eats away at him, he secretly begins a search to learn if the baby's mother is still alive. Why I picked it up: I've seen a real increase in books about World War I because this year marks its 100th anniversary. I've become very interested in reading about the Australian and British experience of the war. Tom is a WWI veteran. Although we don't see much of the war, the novel presents plenty of its devastating effects on the communities of Western Australia. Why I finished it: Tom and Isabel made the bad decision to keep the baby out of love. Isabel was heartbroken after her stillborn baby and longed for a child. It seemed, to her, a sort of gift that another child was delivered in a rowboat. Isabel cleaned up the girl and breastfed her. They bonded immediately. When Tom later discovered the identity of the birth mother and saw how her grief had aged her, he immediately felt guilty. At this point the baby was several years old and was very much at home with the Sherbournes. The story unfolded in such a way that I was sympathetic to both Tom and Isabel as well as the birth mother. The story and the ethical dilemma of keeping the baby was so well crafted that I couldn't put this book down. It's perfect for: Shannon, who has lighthouse photos and sculptures decorating many of the rooms in her house. I think she'd love the details about being a lighthouse keeper, especially about the maintenance it takes to keep one running from the oiling of the machinery inside the light casing to the record keeping and dealing with the weather. @bookblrb: A lighthouse keeper and his wife find a baby that washes ashore and raise it as their own. Two years ago, everyone on flight 815 suffered from amnesia. The pilots couldn’t remember how to land, the stewardesses only knew they were working because of their uniforms, and the passengers didn’t remember how they got aboard. The manifest showed 121 people were on the flight. Only 120 got off. Henry Lyme was the missing passenger. Meru writes unsolved, true crime books. Her first was a best seller. Now she has a new idea (and one her agent has apparently heard before): She’s going to track down Henry Lyme and find out what happened. Contains MIND MGMT #0 - #6. Why I picked it up: Matt Kindt’s graphic novels (Super Spy, Revolver, others) are awesome. Why I finished it: Kindt’s books always have something to do with spies. It’s not much of a surprise in this book given that the MIND MGMT field guide, a manual for its agents, appears around the edges of the pages. It contains information on making cadavers disappear, communicating psychically, and using mind-wipe techniques. It was a perfect hint for what was to come as Meru gets deeper and deeper into her investigation, finds a town in Mexico where all anyone does is make the same pot over and over (the design is from Zanzibar), and goes to talk to dolphins. It's perfect for: My friend Dave. He’s a bit of a conspiracy theory nut, though he’s quiet about it. (Yesterday he tried to talk my ear off about how terrorists are probably filling the missing Malaysian airliner with fuel to turn it into a bomb. As I write the plane hasn’t been found.) He’d like the idea of a secret government agency and psychic agents like the Ad Man, whose immensely successful ads distract you from stories the government doesn’t want you to notice. @bookblrb: A true crime writer tries to track down the missing passenger from a flight where everyone suffered amnesia.